This compelling story of family, betrayal, and memory starts out in the late 1960s as 18-year-old Bernie is flying to Kadena Air Base, Okinawa to visit her family after her first year at college. She grew up in an Air Force family, under the shadow of larger-than-life Major Mace Root, and popular and beautiful younger sister, Kit. Now she has been “breathing civilian air” for a year and has joined a peace group, Damsels in Dissent. Her large family are astonished at their first sight of her at the airport in tattered jeans with peace symbols and no bra. She, in return, is astonished at how badly her family is dealing with their new assignment, from her teenage sister’s open rebellion to her younger sister’s anxiety to her mother’s cupboard full of Valium. The story moves forwards and backwards in time from the 1960s to the 1940s, with poignant descriptions of the plight of Japanese civilians in the immediate aftermath of World War II when work, shelter, and food were in short supply. Slowly the picture is revealed of Bernie’s past and the book explores the nature of blame, responsibility, and human ties as Bernie comes to a wrenching realization about the triggers of her family’s disintegration eight years earlier during their posting to Yokota, Japan. In turns both funny and sad, The Yokota Officers Club is a story about loyalty – to family and to country, and to people who surround us. It is based on Sarah Bird’s own childhood and she dedicates the book to her family – her Lieutenant Colonel father, nurse mother and three brothers and two sisters, just like Bernie’s family. 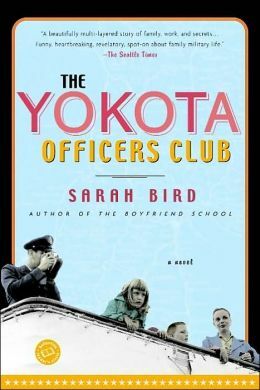 But in the acknowledgements she adds, “to my family who… understood and accepted my capricious weaving of fiction through our shared past.” Try The Yokota Officers Club for an emotional, character driven read about family relations. Check the WRL catalog for The Yokota Officers Club. Should have won the Pulitzer for that year! another excellent book from the wonderful Sarah Bird!! Yes, it’s a great book! I am planning to suggest it for my bookclub to read next year. Several of us are military spouses so it should spark an interesting discussion.